The day started rainy with promises of thunderstorms, but George, Jean, John and Andrew strated out from Kentish Town Station, we found Pat on the train and then met Penny, Jim and Sue at St Albans station. We took the Sustrans path on the old railway track east from the station and then turned left onto the only really busy road of the trip. We rode past Wheathampstead and then at Ayot St Lawrence the rain stopped and we were pleased to take off our waterproofs. The little lane in the photo was a bit stony and seems to have been responsible for at least four punctures. 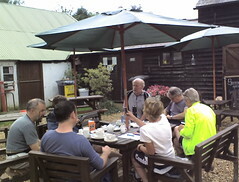 After patching or replacing several tubes we eventually all reached the lunch spot: Emily’s Tea Rooms which welcomes cyclists. 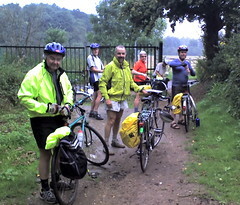 After lunch we continued north via Lilley and Kings Norton, where John and Pat left us to pick up the train at Luton. The rest of us continued to enjoy the countryside, partcularly Sharpenhoe Clappers. As promised, the last climb into Harlington was a stiff one. We were lucky to get a train about 5 minutes after arriving at the station.